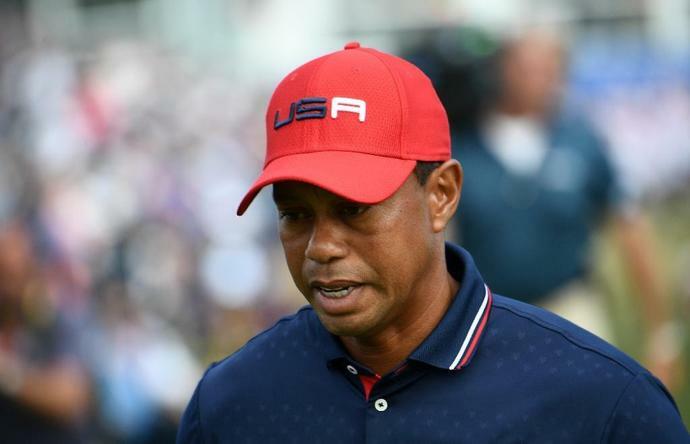 Saint-Quentin-en-Yvelines (France) (AFP) - A despondent Tiger Woods admitted that he "was a contributing factor" as to why the United States surrendered the Ryder Cup to Europe, after losing all four of his matches at Le Golf National. The 14-time major champion suffered only his second singles defeat in the match-play showdown with a 2 and 1 loss to Jon Rahm as Europe charged to victory. His miserable Ryder Cup record now stands at 13 wins, 21 losses and three halves. "It's disappointing because I went 0-4, and that's four points to the European team," admitted Woods. "I'm one of the contributing factors to why we lost the Cup, and it's not a lot of fun. "It's frustrating because we came here, I thought we were all playing pretty well, and I just didn't perform at the level that I had been playing, and just got behind early in the matches and never got back." The former world number one headed to Paris in high spirits after capping a magnificent comeback season from injury with his first title since 2013 at the Tour Championship last week. But it all went badly wrong, losing twice in the fourballs alongside Patrick Reed and once in the foursomes with Bryson DeChambeau -- all defeats coming at the hands of Tommy Fleetwood and Francesco Molinari. Woods said that fatigue may have played a part in his struggles, having barely played in 2016 and 2017 and having spinal fusion back surgery. "I played seven out of nine weeks... All of those are big events, starting with the Open Championship," said the 42-year-old. "For me, it's been a lot of golf for a short period of time. "I'll have a better understanding of what my training needs to be for next year so that I certainly can endure the entire season because this year was very much up in the air of how much I would play or if I would play at all." The Americans had high hopes of winning in Europe for the first time since 1993, with Woods among nine major champions in their ranks, but were blown away after winning the opening three fourball matches on Friday morning. Woods did not play as poorly as some of his teammates -- being badly let down by a misfiring Reed on the first two days -- but was a shadow of the man who sealed his emotional comeback just days before. "To have a Ryder Cup end that way, for me personally, it doesn't feel very good because I didn't help my teammates earn any points," he added. "At the end of the day, we came here as a team and we win or lose, and unfortunately we lost this one." The former prodigy has announced that she is taking "an indefinite leave" from golf to try to cure a long-time hand injury, after having to cut her 2018 season short to undergo an operation. Of course, Woods made several aborted returns himself when trying to return from his back problems. "Had an encouraging visit with my doctor, however we both think it's in my best interest to take some time away to allow my body to heal properly and get stronger," Wie, 29, posted on Instagram. The phone started ringing in the days after Tiger Woods won the Masters. This was in Minnesota, though it could have been most any city that hosts a PGA Tour event. "I got called by two affiliates, either the Monday or Tuesday after the Masters, and they wanted to come over with a camera crew," said Peter Mele, tournament director of the new 3M Open the first week in July. AVONDALE, La. Sergio Garcia was trunk-slamming early for the second straight year at Augusta National, but that didn't stop him from catching a piece of Masters history two Sundays ago. Garcia said he was watching along on television as Tiger Woods captured his fifth green jacket and completed one of the more improbable comebacks in sports history. The Tiger Woods tributes continue to make headlines in the wake of his first major title in 11 years; Brooks Koepka keeps making himself happy; and a look at "tennis golf," the mashup sport you never knew existed, even if it isn't really necessary. All that and plenty more in this edition of The Social. WHAT WE'RE CHIRPING ABOUT More than a week has passed since Tiger Woods won the Masters - another PGA Tour event has come and gone, the Easter Bunny brought eggs full of candy to eager kids (among other things) and Kanye West closed out Coachella by selling socks for $50 - but it appears Tiger-mania is still in full effect. Dustin Johnson maintained his position as the world number one on Monday despite collapsing out of contention in the RBC Heritage at Hilton Head. The former US Open champion remains at the top of the latest rankings, holding a slender lead over Justin Rose and his fellow American Brooks Koepka. Johnson took a one-shot advantage into the final round on Sunday, before making four bogeys and two double-bogeys to drop to a tie for 28th. Is the Zurich Classic's team format still fresh in Year 3, or is it already tired?